Theater Review: Ballard High's "Is He Dead?" In mid-October, I saw the play Is He Dead? with a couple of my friends, and it was probably one of the best plays I have seen. This community play was probably as good as something you would see on Broadway, right in your very own neighborhood. Is He Dead? 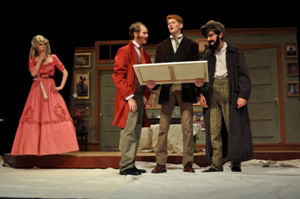 is a comedy by Mark Twain, and this production was directed by Shawn M. Riley. It’s quite a popular play but was very well done by the people who worked very hard on it. There’s really not much I can say. The costumes were great, the acting was great, everything was great. Is He Dead? ever comes to your neighborhood, don’t wait. In the meantime, you can check out the library’s copy of the play itself or a graphic novel based on the play. This entry was posted in Teen Powered, Theater and tagged Ballard HS, Theater, theatre, written by teens on December 13, 2011 by Teen Blogger.